This post explains about import registration procedures to be obtained from Malaysia government authority for importation to Malaysia. How to get import licence in Malaysia? 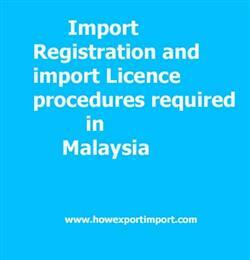 What are the procedures for registration as an importer in Malaysia? How to start an import business in Malaysia? What are the certification formalities to import to Malaysia? If you need to import goods or services, a onetime registration procedure is being completed in most of the countries. Such import export licence may be obtained from concerned government department of Malaysia if required. To import or export goods which require a license, traders first must register with the Companies Commission of Malaysia. Once registered, a company must then apply for an import license from the Ministry of International Trade and Industry (MITI). The Ministry of International Trade and Industry (Malay: Kementerian Perdagangan Antarabangsa dan Industri), abbreviated MITI, is a ministry of the Government of Malaysia that is responsible for international trade, industry, investment, productivity, small and medium enterprise, development finance institution, Halal industry, automotive, steel, strategic trade. Malaysia uses a privatized single digital window for all import and export regulations called Dagang Net. For eg, Imports of meat and poultry are regulated through licensing and sanitary controls. All imported beef, lamb, and poultry products must originate from facilities that have been approved by Malaysian authorities as “halal” or halal certificate from the Department of Islamic Development of Malaysia (JAKIM)., or acceptable for consumption by Muslims. This information is about import licensing procedures to import goods to Malaysia. If you have to add more information about import permit and registration required to import goods to Malaysia, share below your thoughts. Import registration procedures required in TAWAU. Import Licence process in TANJONG MANI. Process to import to SIBU. Requirements of registration to import to SANDAKAN. Registration requirements in PORT KELANG to import. Registration needed to import to PENANG. How can I register to import in PASIR GUDANG. What Licence requited to import in MIRI. What should I do to import goods in KUCHING. How to get import licence in LABUAN. Procedure to get registration to import in LAHAD DATU. Mandatory process need to complete import in KUANTAN. First permission required to import in KOTA KINABALU. How can I start import business JOHARBAHRU ?. How to begin import trade in Subang? Permission to initiate to import in Penang. The way to get registration to import in BINTULU. Introduction to this web site. How to make delay in delivery of Shipment? How to obtain a duplicate BL, if original bill of lading lost. How to obtain GSP - Certificate of Origin? How to import to India from Gambia? How to export from India to Gambia? How to export from India to Malaysia?